The girl upstairs had a late night last night. So I needed a bit of a sleep in to recover from all her noise. Katha and Celia are on their way to the South of France so I thought I would tackle the Metro on my own. I walked up to the Metro Republique, it is a very handy Metro station to be staying near as it is a junction for a few lines. I didn’t see the Romanian family that live up outside the Monoprix so I saved myself some coinage. A lady at work gave me a great book that everyone coming to Paris should have. It is small, doesn’t weigh much and includes the little streets and Metro details . It is called “The Paris Mapguide -the one to carry with you” which is a suitable title I think. 😉 I also have one of those crumpled ( cloth) maps that one of my sisters gave me. It is wonderful when you are lost in the rain and/or you need big print. It could also double up as an emergency hankie. I will be buying crumpled maps to other countries I visit. It is a pity that they do not include the little side streets though. I managed to get over to the left bank via the Metro. I was reading Bill Bryson’s “neither here nor there” while I was on the Metro. It is a very funny book and perhaps best not read while sitting on a Paris train by yourself ’cause if you laugh out loud you no longer have the depressed look that seems to be the only facial expression to travel the Metro with. I went to a shopping strip on Rue de commerce over on the left bank not far from the Eiffel tower. I found a few shops over there that have clothes I possibly could have fit in to. Being buxom/voluptious in Paris makes it hard to find clothes that fit. So trips in to shops can be rather brief. 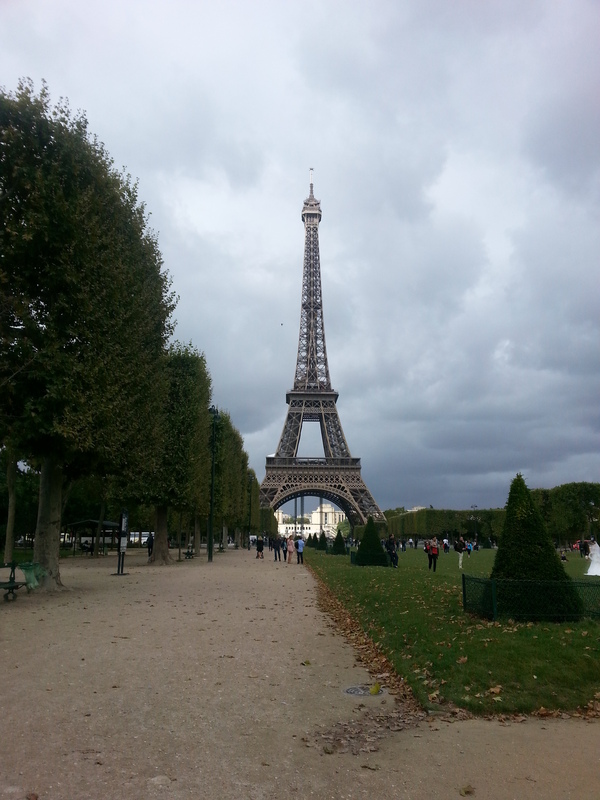 I thought while I was over that way I might as well go and see the Eiffel tower. It was gypsyville. I practised my disgusted NO! and managed to get out with all my money,phone and card. 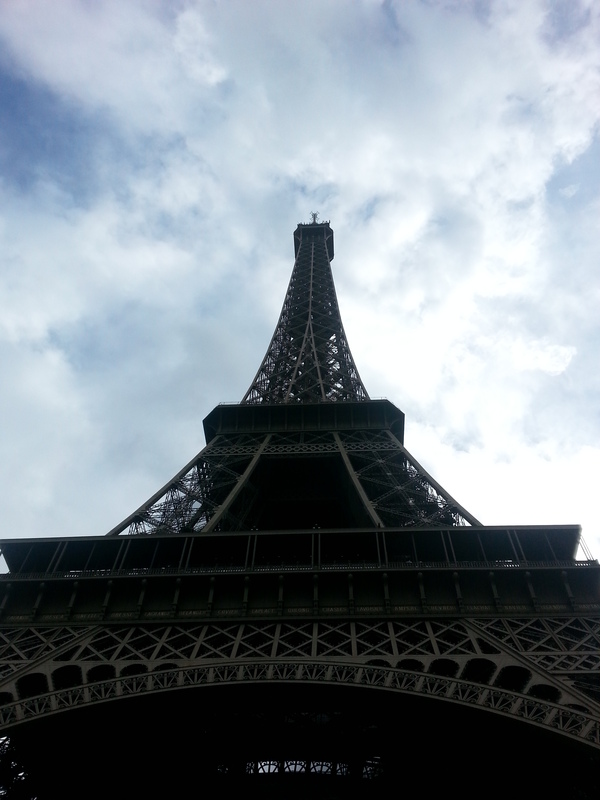 I didn’t go up the tower due to my inability to have any patience in a queuing situation. I did go down to the Seine to see about going on a cruise but as I asked for details of the cruises the heavens opened and a big downpour of rain drenched me. Umbrellas are pretty useless in windy heavy rain. I should have had my parker with me. I managed to get back to the right bank and find a Metro without slipping and made my way back to Le Marais. I thought I would go to Marche des enfants rouge to get some tomato salad but it isn’t open on a Monday. A tradesman told me it had shut forever. I googled that when I got home and I think he may have lost his intended message in translation. Either that or he was just another French person making up an answer to a question. I will find out tomorrow when once again I try to buy some tomato salad.